The TDI Intro To Tech Course at Koh Chang Thailand, introduces the recreational diver into the world of Technical Diving by showing the diver how to use 2 cylinders carried on the side of the diver instead of the conventional Tank on the back of the diver or a Twinset, which is a unification of 2 cylinders also carried on the divers back. 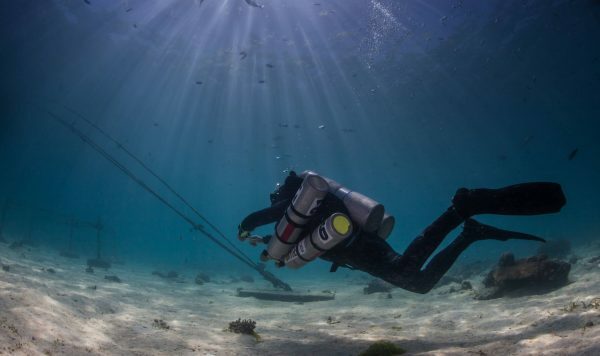 The objective of this course is to familiarise students with technical gear configurations, to enhance open water diving skills (including buoyancy, trim, propulsion techniques, and situational awareness), and to introduce students to advanced gas planning techniques within a no-decompression context. Subject areas covered in this course includes, physics, physiology, equipment considerations and configurations, dive planning, and dive procedures. This course is strictly a no-decompression course. Students are permitted to use Enriched Air Nitrox mixes, provided the gas mix is within their current level of certification. This course is a useful stand-alone course for the diver who wants to become a more skilled, more proficient diver regardless of whether or not the diver intends to move on to technical diving. This program is a standalone designed to experience tec diving.